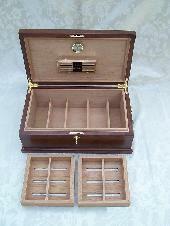 • Measures 18 5/8" x 11 ¼" x 7"
The finest solid Cherry hardwood was selected to create this stunning, handcrafted humidor. Featuring a Traditional Cherry hand-rubbed finish to enhance the natural beauty and richness of the wood, this humidor provides storage for over 100 cigars. The Spanish Cedar interior includes adjustable dividers, removable trays and the preferred Credo Precision70® Onyx Humidifier and Credo® Hygrometer. The decorative handles, hinges and old-fashioned lock & key are made from solid brass and have a gold-plated finish. Each Quality Heirloom humidor is handcrafted, one at a time and features exceptional quality craftsmanship. This striking humidor will surely become a cherished family heirloom that will be proudly passed on to future generations. 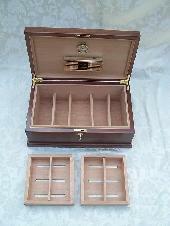 • Measures 18 5/8" x11 ¼" x 7"
The finest solid Mahogany hardwood was selected to create this stunning, handcrafted humidor. Featuring a Traditional Mahogany hand-rubbed finish to enhance the natural beauty and richness of the wood, this humidor provides storage for over 100 cigars. 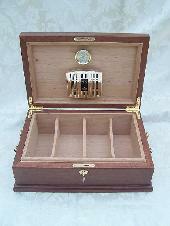 • Measures 15" x 10¼" x 5¼"
The finest solid Mahogany hardwood was selected to create this stunning, handcrafted humidor. Featuring a Traditional Mahogany hand-rubbed finish to enhance the natural beauty and richness of the wood, this humidor provides storage for 60-80 cigars. The Spanish Cedar interior includes adjustable dividers and the preferred Credo Precision70® Epsilon Humidifier and Credo® Hygrometer. The decorative handles, hinges and old-fashioned lock & key are made from solid brass with a gold-plated finish.